under Blewett. As Blewett was shuffled to second, Coby and Marquis made contact, sending both drivers to the wall and slowing the outside lane. Rick Fuller, Eric Beers, John Blewett, III, and Dave Etheridge took full advantage, sliding into the Top 5. Tony Hirschman picked a great night to take his second consecutive win on the NASCAR Whelen Modified Tour at Thompson Speedway (CT). With the struggles of point leader Ted Christopher, Hirschman now finds himself atop the leaderboard as the season begins to wind down, and is aiming at his second straight WMT title. After earning the Bud Pole in time trials, the defending Tour champion redrew seventh to start the Bud 150. Doug Coby, who qualified eighth and redrew the pole, set a blistering pace during the first half, stretching his lead to more than ten car lengths over top runners Ed Flemke, Tom Bolles, Mike Stefanik, Hirschman, and Hirschman's son, crew chief and driver himself, Matt Hirschman. As the yellow flag flew on lap 81, the majority of the field came to pit road, including the leaders. 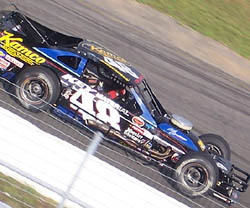 Hirschman's crew got him out ahead of Coby, and he restarted behind Jimmy Blewett, Jamie Tomaino, and Zane Zeiner, who each stayed on the track. Blewett lead until lap 91, as WMT point leader Ted Christopher took over. Christopher looked to be able to run well, but was forced to pit with a flat tire under caution on lap 94. The yellow flag had flown for a Turn 1 pileup involving Jimmy Storace, Flemke, Zeiner, Chris Pasteryak, and Gregg Shivers. Only Storace was able to continue. 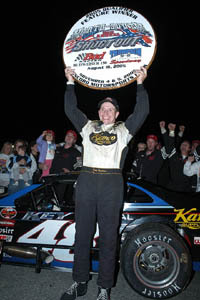 Hirschman then fended off Fuller, Beers, and later Mike Christopher, for four more restarts, including one that followed a scary incident with rookie Tyler Haydt. After contact from behind with Ted Christopher on lap 106, Haydt's car pounded the Turn 1 wall, bringing out the red flag. Haydt was shaken up, but otherwise uninjured. "We've been good," said Hirschman following the win. "All we can do is work hard to get a car that runs that good every week. There are seven races to go, I don't know if we can keep it up or not. There could some bumps in the road, but tonight was a real good night for us." Fuller finished second ahead of Beers, but was happy just to be in a position to contend for the win. Both drivers were forced to start the Bud 150 from the rear of the field, after working on their cars during the NASCAR impound between qualifying and race time. Fuller's crew changed the flywheel on his car, while the Beers crew changed carburetors. Both drivers made their way through the field and were running Hirschman down near the end of the race. Mike Christopher held on for fourth ahead of a late-charging Chuck Hossfeld. Hossfeld struggled deep in the field early before making major changes to his car. John Blewett, III, Marquis, Bolles, Donny Lia, and Etheridge completed the Top 10. 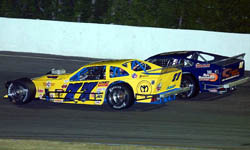 Ted Christopher, who entered the night as the WMT point leader, finished a distant 20th, seven laps behind the leaders. Hirschman now leads Christopher lead by 63 markers. Stay tuned to Speed51.com for more in the coming days. We'll have a full serving of leftovers - Modified Tour style coming later this week.